Landmark: Barks's only painting with a scene in outer space. Based on: W US 10-02 in "The Fabulous Philosopher's Stone"
Publication date: 1997, June 3 ? 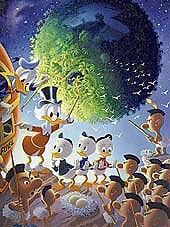 Issue: Uncle Scrooge McDuck by Carl Barks - Uncle Scrooge Adventures 25 ? Additional credits: Second try of three 1970s paintings with the Flying Dutchman as subject. Barks began this painting in 1972, and finished it in 1991. 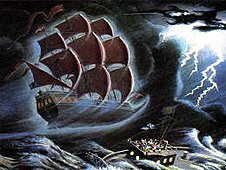 Paintings "Flying Dutchman [72-23]" and "Flying Dutchman [72-25]" are the other ones. 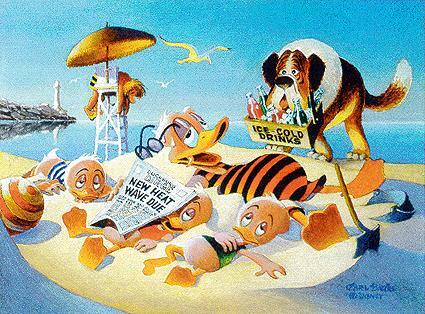 Backstage: In a July 26, 1972 letter to Donald Ault, Barks explained that he abandoned the second try and started over so only the 1st and the 3rd were completed. This painting was eventually finished together with the other two, before January 1973, but Barks never sold it. Sometimes, thru the years, he went back to it and tinkered with it. Questions: Does the picture show the painting after it was finished? What's the exact source of the picture? Snow theme. Money bin exterior. Money theme. Money bin interior. 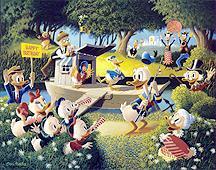 Landmark: One of the largest paintings that Carl Barks ever did. Additional credits: Made to celebrate Donald's sixtieth birthday. Additional credits: Mentioned by Barks as item in a list of his latest work, as part of a [1999?] [letter?] to an unidentified fan. Money theme. Money bin interior. 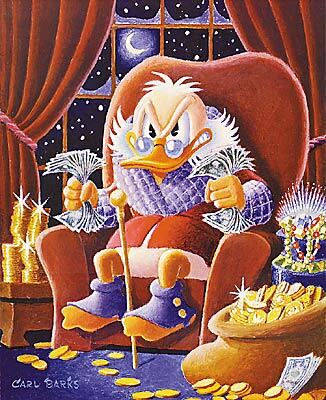 Scrooge in bin tossing money. Owners, past and present: Sold to a collector. Additional credits: At the request of owner Steve Geppi, Barks retouched »Wishing Well [71-20]« into this new version. 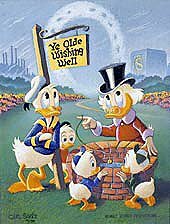 Most noticable are the changes in the background: the trees of the 1971 version were replaced by the industry silhouette and Scrooge's money bin. Also, a horseshoe-shaped halo (or rainbow) was added in the background. Additional credits: Mentioned by Barks as 12th unnumbered item in a list of his latest work, as part of a [1999?] [letter?] to an unidentified fan. Money theme. Money bin interior. 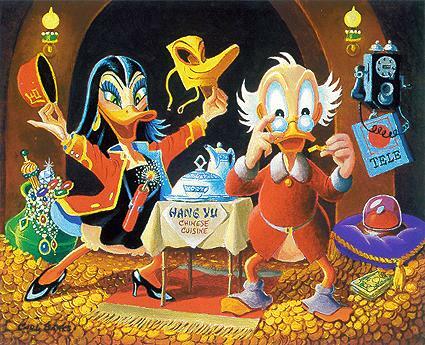 Scrooge in money bin reading paper out of a fortune cookie, which with a Chinese dinner has just been delivered by Magica de Spell disguised as a Chinese delivery man. 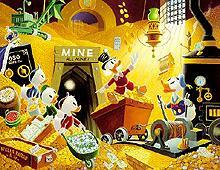 Backstage: "I just finished a new oil painting of Uncle Scrooge's money bin. It is my first painting featuring Magica De Spell. Magica has delivered Chinese food to Uncle Scrooge in disguise." Mr. Barks explained. "She has a huge firecracker lit [in the food]. As she takes off her disguise, Uncle Scrooge says 'Wonder What My Fortune Cookie Says?,' which is the title of this painting." (1996 Pop Art Time article by Jacquie Kubin) As described in the article, Barks then continued saying that the character Magica is extremely popular in Italy as she lives on Mt. Vesuvius, south of Rome. Owners, past and present: Evidently owned by one of the former Carl Barks Studio managers. CB OIL 145 "Merry Christmas!" Additional credits: Mentioned by Barks as 6th unnumbered item in a list of his latest work, as part of a [1999?] [letter?] to an unidentified fan. The actual size is said to be 10 inch x 12 inch (instead of 11 inch x 14 inch). Christmas theme. Money theme. 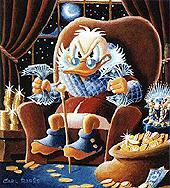 Scrooge in classic pose of his introduction in Christmas on Bear Mountain, holding greenbacks tightly in his hands. Owners, past and present: Owned by a collector. Notes: Dreidreizehn planned to publish the painting in their 2001 calendar, which didn't happen. Questions: Is »"Merry Christmas! "« really the title of the painting? Additional credits: Mentioned by Barks as 7th unnumbered item in a list of his latest work, as part of a [1999?] [letter?] to an unidentified fan. Finishing work initiated in the 1970s. 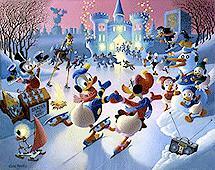 Barks signed 400 serigraphs of the subject, which was © USA Disney, Morby, Grandey. Scene based on an old cover drawing of the ducks on a sandy beach being served by a life-saving Saint Bernard dog. Backstage: A colour photo of Barks posing with the painting has been published. Owners, past and present: Evidently sold to Egmont. Questions: Is »Heat Wave« really the title of the painting? Based on: W OS 456-02 in "Back to the Klondike"
Additional credits: Mentioned by Barks as 8th unnumbered item in a list of his latest work, as part of a [1999?] [letter?] to an unidentified fan. Klondike theme. 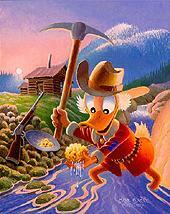 Scrooge in the Alaska gold rush picking up the "Goose Egg Nugget" from a creek. 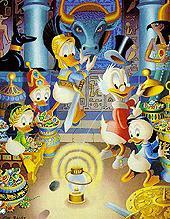 Backstage: Celebration of the 100th anniversary of the Alaskan / Yukon Gold Rush and the founding of Scrooge McDuck's immense fortune. The memorable event took place amid the privations and loneliness of Canada's vast Klondike area when the loveable comic book character first unearthed the fabled nugget in 1898. 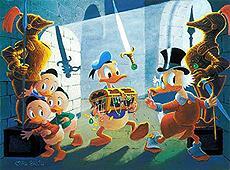 It is also the official painting for the golden anniversary of the first appearance of Uncle Scrooge in 1947. Owners, past and present: Sold to two collectors, who are trying to get it used for a commemorative gold rush postage stamp. Based on: W OS 189-02 in "The Old Castle's Secret"
Additional credits: Mentioned by Barks as 9th unnumbered item in a list of his latest work, as part of a [1999?] [letter?] to an unidentified fan. Uncle Scrooge, Donald, and the kids in the old castle in Scotland. A sword held by an invisible hand threatens them. Questions: Is »Old Castle Secret« really the title of the painting? Additional credits: Mentioned by Barks as 14th unnumbered item in a list of his latest work, as part of a [1999?] [letter?] to an unidentified fan. No title. The orderer asked for something with a helicopter. Money theme. Uncle Scrooge in an American Indian feather headdress smoke-writing dollar signs with a blanket. Above him Glomgold in a helicopter sprinkles water on his fire. Owners, past and present: Sold to Hans Gallery, Germany. Notes: Two preliminary drawings are said to exist. Dreidreizehn planned to publish the painting (with these two preliminaries?) in their 2001 calendar, which didn't happen. Questions: Has this material been published?